An integrated approach to purchasing care in DoD and VA would be legally permissible under existing authorities, but appropriations language would need to change. In recent years, there have been significant changes to how DoD and VA manage health care, in addition to new policies affecting the U.S. health care system in general. Any decisions must consider how this evolving policy context will affect the feasibility and effectiveness of an integrated purchased care approach. The benefits of an integrated purchased care approach in terms of patient experience, provider availability, cost savings, and operational efficiencies are uncertain but may be limited. The U.S. Department of Defense (DoD) and U.S. Department of Veterans Affairs (VA) health systems are each responsible for providing health care to more than 9 million eligible beneficiaries, with some overlap between their populations. Both systems provide services through a mix of direct care, delivered at government-owned and -managed facilities, and purchased care, provided through the private sector, mainly by community-based providers who have entered into contracts with third-party administrators (TPAs). TPAs coordinate and administer reimbursements to network providers on behalf of DoD and VA for delivering health care services to eligible beneficiaries. To help provide insights to policymakers on whether DoD-VA resource sharing could unlock greater efficiencies and cost savings, RAND researchers conducted a preliminary feasibility assessment that examined how an integrated approach to purchasing care could affect access, quality, and costs for beneficiaries, DoD, and VA. The study also identified general legislative, policy, and contractual challenges to implementing an integrated purchased care program. The study drew on a review of the literature on private-sector and government program practices for purchasing health care services; analyses of DoD and VA data on purchased care use and provider networks; and interviews with DoD and VA officials, TPAs, health benefits consulting firms, military and veteran service organizations, and congressional oversight committee staff, as well as individuals with expertise in the evolution of purchased care programs in DoD and VA.
Because there was not a shared understanding across stakeholders of what an integrated approach to purchasing care would look like, the study assumed that it would involve the two departments using a single contract mechanism to construct a shared network of health care providers who would serve the entire DoD and VA enrolled populations, along with some level of shared oversight by the two departments. 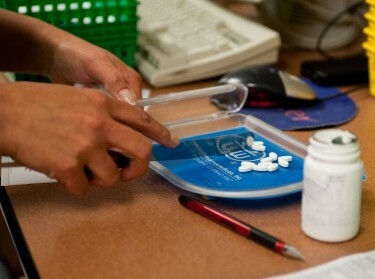 Although future changes in the size of the covered populations or eligibility for DoD or VA health care would affect how the departments balance health care delivery across their direct and purchased care programs, the study also assumed no changes to benefits (services offered or covered) or eligibility. legislative, policy, and operational opportunities and barriers. DoD's Military Health System provides care through the TRICARE program to active-duty service members, reserve service members, retired military personnel, and their dependents. Through the Veterans Health Administration, VA serves eligible veterans and, in some cases, dependents, caregivers, and survivors. There are several differences in how DoD and VA operate their purchased care programs. For active-duty beneficiaries, who pay no out-of-pocket costs, DoD purchases care from the private sector only when necessary to supplement military treatment facility capacity. For other beneficiaries, TRICARE benefits and plans differ in terms of how beneficiaries access care and their level of cost sharing. For example, dependents of active-duty personnel do not pay out-of-pocket costs unless they use out-of-network care without a referral. Other beneficiaries pay enrollment fees and copayments, depending on their plan type and point of service (in-network or out-of-network provider). VA health care is allocated on the basis of availability, and eligibility depends on the department's budget and a veteran's "priority group" assignment, which takes into account service-connected disabilities (which involve no out-of-pocket costs to veterans), income, service during a conflict, commendations, and other factors. VA purchases care through a complex array of programs, including individual contracts with providers and contracts with TPAs to purchase care for large geographic regions. There are also differences in the roles of TPAs. For example, VA TPAs manage only small pieces of a veteran's overall health care, typically a single episode of care, limiting their ability to predict demand for providers, manage population health, and implement quality improvement measures. VA TPAs also do not oversee claims processing. Figure 1 shows the share of TRICARE and VA beneficiaries enrolled in both programs, a result of overlapping eligibility criteria. However, overall, there are significant differences between the populations served — particularly in terms of age. Nearly half of the VA enrollee population is over age 65, whereas the beneficiary population eligible to access the TRICARE network is entirely under age 65. On the other end of the age range, there are no VA enrollees under age 18, while children make up 21 percent of the TRICARE beneficiary population. These differences are important when considering the requirements of a joint purchased care contract, which would need to ensure the availability of specialty care for a combined population of beneficiaries. RAND's study examined purchased care use by DoD and VA across nine types of care (inpatient, surgery, emergency care, primary care, physical therapies, oncology, obstetrics/gynecology [OB/GYN], cardiology, and mental health care). Figure 2 shows differences between TRICARE and VA in the share of providers across a subset of specialties, with some providers grouped by whether they treat children or adults. Across all specialties, 29 percent of providers contract with both networks. Over the past several years, both DoD and VA have been subject to congressionally mandated changes in how they manage and furnish health care. At the same time, the U.S. health care system has undergone changes that also affect DoD and VA. Any decisions must consider how this evolving policy context will affect the feasibility and effectiveness of an integrated purchased care approach. As summarized in Table 1, both departments' authorities and appropriations generally allow them to purchase care for their beneficiaries, subject to various restrictions. These authorities and appropriations also allow for some level of resource sharing. However, the statutory language refers to particular programs within the departments. DoD and VA would likely need new statutory authority for a joint, integrated contract and would also likely need different appropriations language to purchase care through such a contract. Can DoD or VA use the other's contract (Veterans Choice or TRICARE) to purchase care for its beneficiaries? Yes, under existing authorities to purchase care for their beneficiaries, existing appropriations for that care, and government-wide authorities to purchase goods or services through other agencies. However, DoD and VA would need strict controls to ensure that their appropriations went only to their beneficiaries and that these beneficiaries were reimbursed as required. Do current "resource-sharing" statutes enable joint contracting? Maybe, although congressional staff expressed an opinion that these authorities were meant for narrower pilot programs and that members of Congress would likely be skeptical of large-scale resource sharing without new authority. Do current appropriations support a joint contract for DoD and VA? No, because current appropriations language specifically mentions the contractual programs used by DoD and VA. Future appropriations statutes would need to be adjusted to incorporate the new joint contract structure and give them flexibility to purchase care through means other than their own current contracts. Although the analysis confirmed that an integrated approach to purchasing care could expand the number of providers available to both departments (as shown in Figure 3 for a subset of specialties), it was not possible to determine whether this expansion would fill gaps for certain types of purchased care. Several interviewees were concerned that combining purchased care programs could create artificial competition between TRICARE and VA beneficiaries for access to the same providers. However, without information about the capacity of each provider and the potential demand for their services within an integrated purchased care program, it is difficult to assess the specific impact that such an approach would have on patient access. RAND's examination of costs also yielded uncertainty, as cost savings would depend on the extent to which DoD and VA harmonize their operational processes, including provider contracting, claims processing, reporting, and customer service functions. While some stakeholders believed that the government might be able to achieve greater cost-efficiency by negotiating lower payments to providers with an increased volume of services, both departments are already paying near Medicare rates to their contracted providers. Although there could be some cost savings associated with integrating contracting functions and processes, legal or regulatory changes in how those contracts are established would be required to achieve any real savings to the government (as opposed to merely shifting costs from one department to the other). The study's findings led to two recommendations that are aimed primarily at reducing the uncertainty of the impact associated with an integrated purchased care approach. These recommendations should be considered in parallel but would likely best be implemented in sequence because the results of additional analysis will inform a demonstration or pilot. Research that examines differences in demand for purchased care across specific geographic regions, patient populations, and individuals would provide a more robust understanding of whether merging provider networks would help improve provider access and the availability of care. It will also be necessary to determine whether providers perceive barriers to participating in the network of one department versus the other to understand whether providers would want to join this joint network. Further analyses on merging contracting functions could also explore specific staffing capabilities and needs across DoD and VA, as well as various options for joint oversight, their advantages and disadvantages, and their costs. Establishing an integrated purchased care program would take several years, but a series of pilots or demonstrations, perhaps focused on a specific type of service, could help clarify how integration might affect access, costs, and quality of care and pave the way to full integration later on. Prior experiences with resource sharing between DoD and VA offer potential insights for these demonstrations. The departments could collaborate with Congress to outline the parameters for one or more pilot efforts for integrating different dimensions of purchased care across DoD and VA. Although there are multiple variations and levels of integration that could be considered, tested, and evaluated in such a pilot, stakeholders suggested choosing a specific geographic region or market or identifying a specific type of health care service or health care provider to examine how integration might affect access, costs, and quality of care. To guide plans for such a project, Figure 4 provides a notional, illustrative outline of how different parts of an integrated purchased care approach could be considered in a building-block fashion. Each step would require additional levels of intervention with respect to legal/regulatory, operational, and governance changes. As a first step, for example, DoD and VA could consider simply sharing lists of providers by requiring their TPAs to exchange relevant information on providers or to facilitate expedited contracting for both departments. The second step would involve the two departments working to consolidate or compile their requirements for purchased care networks into a single contract mechanism that outlines two different sets of rules, functions, and roles for two separate programs. Additional steps would involve increasing amounts of integration. At the highest level, all functions within both health systems would be integrated. According to RAND's review of existing legal and regulatory authorities, an integrated purchased care approach (including a joint contract and shared list of providers) would be legally permissible; however, some changes to existing authorities would be required, specifically with respect to how current appropriations language refers to the relevant programs for purchasing care. A review of the TPA contracts and interviews with stakeholders about how the departments utilize their purchased care contract revealed significant concerns with respect to the operational practicality of an integrated purchased care contract. As more than half of interviewees noted, the "devil is in the details." Without significant changes in how each department engages with its TPAs (particularly for VA), any operational efficiencies would be limited. Carrie M. Farmer @carriefarmer, Terri Tanielian @TerriTanielian, et al. 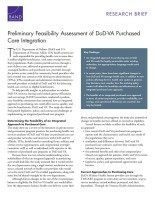 Farmer, Carrie M., Terri Tanielian, Christine Buttorff, Phillip Carter, Samantha Cherney, Erin L. Duffy, Susan D. Hosek, Lisa H. Jaycox, Ammarah Mahmud, Nicholas M. Pace, Lauren Skrabala, and Christopher Whaley, Preliminary Feasibility Assessment of DoD-VA Purchased Care Integration. Santa Monica, CA: RAND Corporation, 2018. https://www.rand.org/pubs/research_briefs/RB10046.html.